Dexter Bexley is a young boy with a scooter. He is out on his scooter on his own one day when he bumps into a Big Blue Beastie and falls down. The Big Blue Beastie tells Dexter that he is bored and will probably eat him up. Unperturbed, Dexter says he has a much better idea. The Beastie seems convinced. He has a scooter too, and follows Dexter as he scoots off again. The pair have a rest at the foot of a tree among the flowers. The Big Blue Beastie complains again that he is bored and will eat Dexter up. The flowers give Dexter another idea, however, and he and the Beastie go into business delivering bouquets. Business booms, and we see them in a spacious office overlooking the skyscrapers of a city. It isn’t long, of course, before the Big Blue Beastie is bored once more. The resourceful Dexter has another idea up his sleeve: they become private detectives under the name Bexley and Beast. Between them they solve the strangest cases, from The Missing Marmoset to The Great Sausage Heist. Inevitably, there comes a point where the Beastie is hungry, and Dexter has to find something to satisfy his appetite before the Beastie turns on him. He succeeds, of course, presenting his companion with an enormous Beastie Feast made with yoghurt, fudge, bananas and ice-cream. The Big Blue Beastie loves it, but it doesn’t quite fill him up. Poor Dexter; he can’t come up with any new ideas, and he says to the Beastie, ‘I suppose now you’ll HAVE to eat me up.’ The Beastie replies that he doesn’t have to do anything, and this time he is the one who has an idea. He buys each of them a lollipop. The story ends as he tells Dexter that he is not terribly hungry now, nor is he as bored as he was because he has found a friend. We see Dexter sitting on the Beastie’s shoulders in the moonlight on the very last page. In “Dexter Bexley and the Big Blue Beastie” Joel Stewart has created an original and imaginative story that most young children will find delightful. The idea of them launching a successful partnership that leads to stocks and shares going up will go over their heads while causing some amusement to the grown-ups reading aloud. They will surely, however, love the fact that Dexter manages to save his skin and keeps coming up with fresh ideas just in the nick of time. The ending, showing that friendship matters more than being hungry or having something to do, is just perfect. The design of the book is also highly original. Some double pages have no more than a line of text on one side and an illustration on the other, both set on a pastel-coloured background. The main story line is set in a clear, good-sized font, but there are also speech bubbles in which the text is set in capitals. Phrases such as ‘said Dexter Bexley’ are added in a font that resembles handwriting. On the whole the vocabulary is straightforward, although there are one or two complicated sentences such as ‘They even apprehended their arch nemesis’. It is a super book to read aloud, but young independent readers are likely to enjoy it too as it is not a childish story. 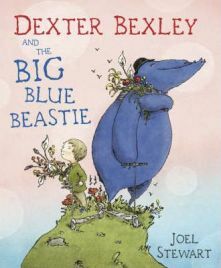 Joel Stewart has illustrated “Dexter Bexley and the Big Blue Beastie” himself. The Beastie is a bit like an old gentleman and wears a black hat and a short, stripy waistcoat. His eyes always look as though they are closed, and his lower jaw protrudes way beyond his upper one. How his skinny feet support his great big body is a complete mystery. Some pages simply show the figures of Dexter and the Beastie on a plain background, but Stewart really goes to town on showing the cases they solve as Bexley and Beast. They chase a ghost on a bicycle, coming parachuting down from the sky with hundreds of inflated rubber gloves, and search a cave by torchlight. “Dexter Bexley and the Big Blue Beastie” is quirky to say the least, but it makes a great change if that is what you are looking for. It would probably suit children of four to five best; any younger and they may not quite grasp the concept. Six- to seven-year-olds might enjoy reading it independently or sharing it with a younger sibling. On first reading it could be fun to ask children to try to guess what idea Dexter will come up with each time, and when they come back to the book they can see if they can remember what Dexter suggests next. I have never come across a picture book quite like this, although I believe Joel Stewart has since published a sequel. It’s slightly scary but full of fun – definitely recommended. No Comments on "Dexter Bexley and the Big Blue Beastie"